“The Commuter” is the latest in the newly bustling subgenre of Liam Neeson Finds People thrillers. 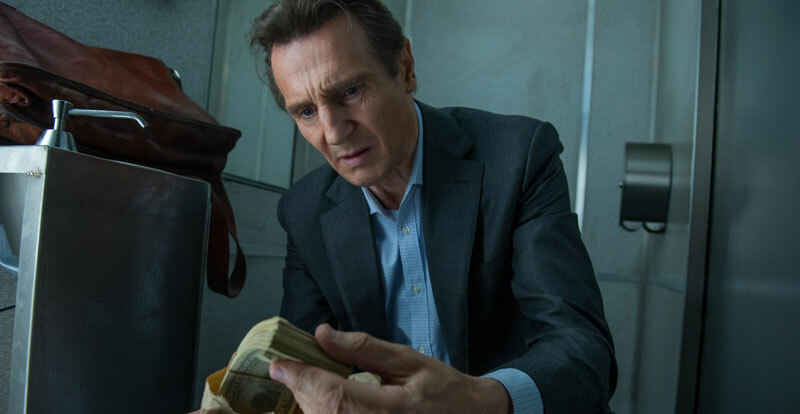 The first entry, “Taken” (2008), was mostly mindless vigilantism in the name of a father’s love. “Non-Stop (2014), while narratively absurd, at least tried to forge something close to a self-loathing anti-hero. 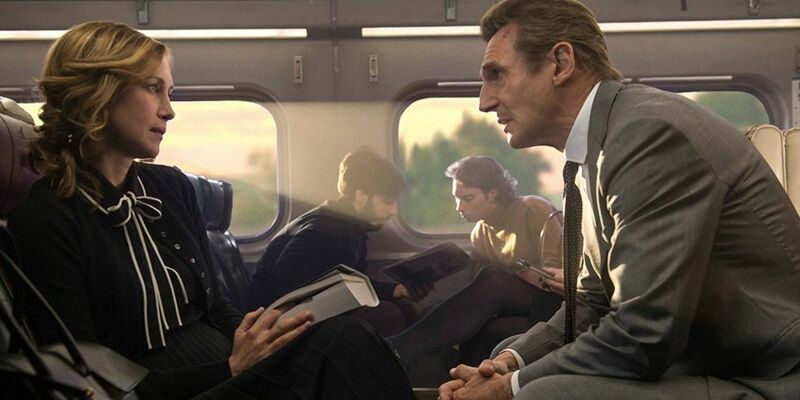 Jaume Collett-Serra’s “The Commuter” (2018), meanwhile, initially strains to – strike that! – succeeds at creating an atmosphere of dread, opening with more than passing nods to reality by explicitly referencing crooked cops, the financial crisis and exorbitant student loans. 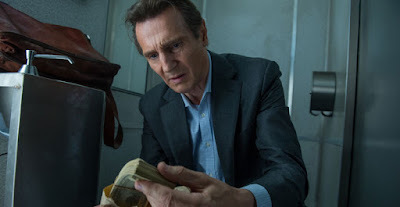 This is the mire in which Michael MacCauley (Neeson), an ex-cop now reduced to peddling life insurance, finds himself when a mysterious woman on his commuter train promises him $100k to find someone before the end of the line – find someone, that is, and kill him/her. And the further the ride goes, the more “The Commuter” loses touch with the tone of its effective opening, which makes you wonder why the opening exists as is in the first place. If you want to be “just a movie” then be one! That opening is a whirling montage of innumerable mornings in which Michael wakes up, goes about his routine, and then takes the commuter train into the city. The swift edits contrast clothes and weather, demonstrating the change of days and seasons, time unstoppably rolling by in the literal blink of an eye, as news pours from the radio and TV, always there and on top of him, while conversations over coffee and breakfast with his wife and son exposit backstory, yes, but also elicit a feeling of how life’s most pressing moments are not necessarily given proper attention or weight, just brushed over in the post-dawn blur. It is the best passage in the movie; the second verse of Dylan’s “One Too Many Mornings” finding life, glorious life, inside a B-movie. It frankly would have been enough all on its own to trigger the movie’s eventual mystery. Nevertheless, the backstory keeps coming, recounted in Michael’s life insurance pitch to a young couple where he blends sales tactics with his character’s history, blatant yet no less delightful dialogue, before – wait for it – he gets fired. That leads him to drown his sorrows at a bar with his old detective partner (Patrick Wilson), a scene where the two men lash out at any number of issues you might find in a quick scan of your morning newspaper. If Michael’s anger at his lot in life feels familiar, Collet-Sera also uses this moment to freshen up an old visual tactic – namely, the jerky, handheld camera. As Michael unloads, Collet-Sera cuts to shots from his side, jerking the camera so violently, even more so than later when the commuter train is out of control, to underscore a life, ahem, off the rails. All this seems to be setting up Michael for a sort of neo-noir when Joanna (Vera Farmiga) sits down across from him on his train and makes an offer that she tells him he can refuse, if he wants, but if he doesn’t, then he’s in, all in. I kept imagining a world-weary Bogart, first with an incredulous smile than a gradual descent into darkness, so close to the edge and then willingly let himself be pushed right off it. Neeson, however, will not let himself be pushed, taking the cash Joanna offers, but only half-heartedly, less a character decision than a narrative trigger, sadly, that transforms “The Commuter” into a puzzle to be put together as Michael goes up and down the rows of the train trying to ferret out the person he needs to find lest bad things happen to his family. At this point, every detail begins locking into place, with AC going out in one train car allowing for a space where Michael can confront people one on one without Collett-Sera and his assistant director needing to wrangle with extras, while even Michael’s established preference for reading literary classics is less a trait than a clue. It’s all clues as the guessing game overtakes any sense of Michael’s established emotional and financial straits, and nearly every relationship proves itself to be a fake out. The whole enterprise is diversionary, I suppose, and there is actually some nice humor mined from the escalating insanity, where passengers don’t necessarily just behave as if they are in a movie but truly on a train that appears to have been overrun by a lunatic. Still, as the movie progresses, the more the portentous atmosphere of the first reel turns out to the biggest fake of all. This comes home in the final scene, a confrontation between Michael and Joanna that I will not explain in full, suggesting that she is orchestrator of this whole ordeal. If she is then everything in “The Commuter” is more or less the product of some grand conspiracy rather than any kind of societal reality, inadvertently reminding us that there is always – always – someone to blame.